Columbia, Mo. (May 26, 2016) — A documentary directed by Missouri School of Journalism graduate student Yuting Jiang won the Best Short Documentary award at the QFest NJ LGBT Film and Digital Media Festival in April. The film, “Mazy,” is about a transgender girl in the St. Louis area struggling to understand herself and fit in to the world around her. 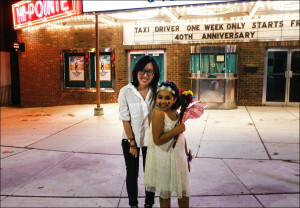 Graduate student Yuting Jiang and the film’s subject, Mazy Gilleylen, appeared together at QFest St. Louis on April 26. Jiang finished the six-minute film this past winter as part of her master’s program. She followed the advice of Associate Professor Stacey Woelfel, the director of the School’s Jonathan B. Murray Center for Documentary Journalism, to submit it to film festivals for possible public screening. Jiang offered her film to general interest festivals as well as those that focus on LGBTQ subject matters for their programs. Five festivals chose the film for showing. In addition to the QFest NJ LGBT Film and Digital Media Festival in Ocean Grove, New Jersey, the film has played at the Docuwest International Film Festival in Denver, Colorado, the Plymouth Film Festival in Plymouth, England, QFest St. Louis and the Queer Brilliance Film Festival in San Francisco. Jonathan Murray, BJ ’77, founder and executive consultant of Bunim/Murray Productions, gave a $6.7 million gift to the School in 2015 to create the Murray Center. The goal is to provide innovative teaching, professional outreach and research programs at the School that will bring together talented students, faculty and professionals from around the world. Woelfel, along with Filmmaker-in-Chief Robert Greene, oversee the Center’s development and activities. Mazy from Yuting Jiang on Vimeo.